The game consists of no blocking and no contact (no jamming)! There is no contact allowed at all. Coin toss determines team to choose either offense or defense. There is no deferring. Choice would be: offense or defense. Two 12 minute halves (1 minute half time). 1 timeout per half. Timeouts do not roll over (Use it or lose it). The offensive team takes possession of the ball at their 5 yard line (start of game and start of 2nd half) and has 3 plays to cross midfield. Once a team crosses midfield, they will have 3 plays to score a touchdown. If the offense fails to score or pick up first down, the ball changes possession and the new offensive team takes over at the 5 yard line. All possession changes, except on interceptions, start on their own 5 yard line. Possession alternates at the half. Seeding games that end in a tie will be ruled as a tie. Playoff games will go to OT (extra point shootout). Pro Clock is only in the 2nd half at the 1 minute warning. Pro clock goes in affect only if it is a one possession game (8pts or less). 1st half has a running clock. There is a 25 second play clock as soon as play ends. Offense needs to get their own ball after each play. The quarterback cannot run the ball. (Unless it is handed off or pitched to him). The ball must be snapped between the legs only by the center who must be on the line of scrimmage. Offense may use multiple handoffs and pitches. Laterals down the field ARE legal. No running zones are designated to avoid short yardage power running situations. No running zones are located 5 yards from each end zone and 5 yards on both sides of midfield. A player who takes the handoff or pitch can throw the ball as long as he does not pass the line of scrimmage. Once the ball has been handed off or pitched, the rush can come from anywhere on the field. Spinning is allowed, but players cannot leave their feet to avoid a defensive play. While running with the ball, ball carrier cannot flag guard. (Diving is not allowed to obtain a first down or TD etc.) The ball is spotted where the ball carriers hips are when the flag is pulled, not where ball is. The hips are the farthest points gained (Not ball spot). All players are eligible to receive passes (including the QB if the ball has been handed off or pitched behind the line of scrimmage). Only one player is allowed in motion at a time. When a receiver has the ball all other players must remain still as to not get an interference penalty (A moving screen). Players must have only one foot inbounds when making a catch. (First foot down). Diving is allowed in an attempt to catch the ball only! Picks are a part of the game as long as the offensive player does not make an obvious attempt to impede the defensive players attempt at coverage by using his arms/body or directly moving into the way of the oncoming defender. A moving pick is illegal in an effort to extend the run of the ball carrier. If a QB's flag is pulled at the same time as releasing the ball, tie goes to the offense. QB has a 5 second pass clock if there is no rusher (as soon as rusher crosses line of scrimmage, QB clock ends). If a pass is not thrown within the 5 seconds, the play is dead, consumption of down. Ball is placed at original line of scrimmage. If the ball is handed off, then the 5 second rule is no longer in effect. A forward pass does not have to cross the line of scrimmage to be a legal play. One forward pass per play. The quarterback/s full body has to be past the line of scrimmage to be considered illegal forward pass. A player MAY return an interception, from ANYWHERE on the field. If a ball carriers flag inadvertently falls off, then he needs to be touched to be down. If a QB chooses to wear a towel, then it is treated as a flag and may be pulled like a flag. Play is ruled DEAD when: Offensive player flag is pulled; Ball carrier steps out-of-bounds; Touchdown is scored; Ball carriers knee hits the ground. There are no fumbles. Ball is spotted where the ball hits the ground. If the referee feels that there is an intentional fumble to better the offense, then it will be consumption of down from the previous line of scrimmage. In the case if an inadvertent whistle, the team with possession has the choice to accept the result of the play, or replay the down. The rusher may not hit the quarterbackÃ?Â¢? ?s arm, or knock the ball out of the quarterback'sÃ?Â¢?? hand. The rusher must play the flags. All defensive players that rush the passer must be a minimum of 7 yards from the line of scrimmage (designated by the referee) and 2 yards left or right of the center when the ball is snapped. Any number of players can rush the passer as long as they are at the 7 yard mark. Players not rushing the QB may defend on the Line of Scrimmage. Once the ball is handed off, the 7 yard rule is no longer in effect and all defenders may rush even if they are within the 7 yards. The rusher must not be head up with the center. The rusher must be at least 2 yards off to either side when starting his rush. The rusher has the right of way to an open path to the QB. If rusher does not run straight in his path, there is no impeding the rusher. This path or zone cannot be disrupted by the offense. If it is disrupted, this will be an impeding the rusher penalty. If the offense is in a bunch formation foot to foot, the rusher must line up outside of the bunch and go around it. If a QB's flag is pulled at the same time as he's releasing the ball, tie goes to the offense. Ball has to be clearly released. NOT ARM IN MOTION. If the field monitor or referee witnesses any acts of tackling, elbowing, cheap shots, blocking, or any unsportsmanlike act, the game will be stopped and the player will be ejected from the game and the team will be assessed a 15 yard penalty. FOUL PLAY WILL NOT BE TOLERATED. TRASH TALKING is illegal. Let your play do your talking! The referee has the right to determine language which is offensive. The referee will give one warning, after that the referee will eject a player for four downs. The next offense will be an ejection from the game. All pre snap offensive penalties are not loss of down. All post snap offensive penalties are consumption of down. All post snap defensive penalties are automatic first down. All offensive penalties in their own end zone results in a safety. Defense Off sides = 5 yards; Pass Interference= Spot foul and automatic first down; Illegal Contact (holding, blocking, etc.) =5 yards and automatic first down; Illegal Flag pull (before receiver has ball) =5 yards and automatic first down; Illegal Rush (start rush from within the 7 yards) =5 yards; Rusher making contact with any part of the QB's arm or ability to pass = 15 yards and automatic first down; Tackling = 15 yards and automatic first down; Push out = 5 yards automatic first down Delay of game = 5 yards. Offense Pre snap penalties are not a loss of down. Illegal Motion (more than one person moving, false start, motion, etc.) = 5 yards; Illegal Forward Pass (pass received behind line of scrimmage) 5 yards; Offensive Pass Interference (illegal pick play, pushing off/away from defender) = 5 yards; Flag Guarding/Lowering of head or shoulder or stiff arm = 5 yards from spot; Delay Of Game = Clock will stop/ 5 yards; Impeding rusher= 5 yards; Blocking= 5 yards from spot. All unsportsmanlike penalties are 15 yards from line of scrimmage and loss of down, or an automatic first down. Referees determine incidental contact, which may result from normal run of play. All penalties will be assessed from the line of scrimmage except for flag guarding. Only the team captain may ask the referee questions about rules clarification and interpretations. Players cannot question judgment calls. Game cannot end on a defensive penalty; unless the offense declines it. 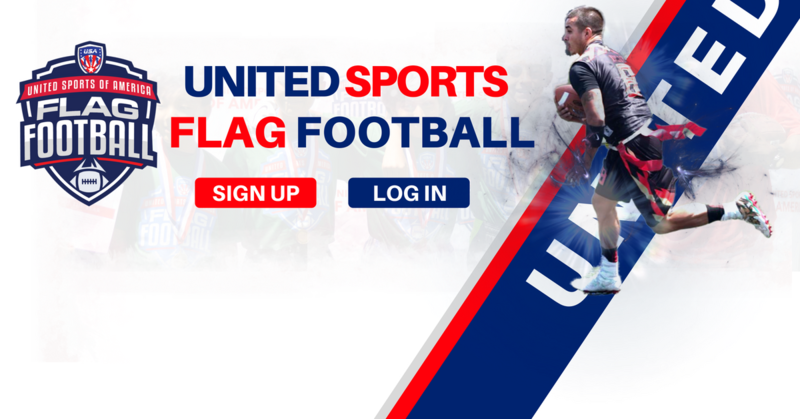 Your team is required to provide your own football (which must be of regulation size and not be under inflated), matching color shirts/jerseys. A roster must be filled out prior to the start of your games. Teams must field a minimum of three players to start game. Teams can have a maximum of 14 players on their roster. Players must be on only one teams roster only per division. Protests may be lodged because of an illegal player (only in playoffs)! To qualify to play in the playoffs, a player is required to play at least 2 seeding games or 2 regular season games. The captain must approach the referee before the end of the game. A protest at any other time will not be awarded. Teams must have matching color jerseys/shirts; Cleats are allowed, except no metal cleats. No boots are allowed. Shirts must be tucked in shorts, pants, and shorts/pants must have no pockets or they must be taped. If shorts have pockets, holding call will not be called. Hats must be worn backwards for safety reasons. Only in Playoffs, NOT regular season games. A coin toss will determine choice of offense or defense first. Both teams will have a chance on offense. Teams will have one play from either the 5 yard line (for 1pt) or 12 yard line (for 2 pts). If after 2 OTs, it is still tied, both teams will have to go for 2pts only (from the 12 yard line). Interceptions can be returned for a walk off win! Flag Football is NOT the same as tackle football; it's different. It's non-contact, its a finesse sport. It might not be for you, you can go play tackle, we can recommend some places for you to play semi-pro. If a player catches a pass, do not run alongside them to screen the defensive players, you're not slick, you should be called for blocking down field and the play will come back. If you're on offense, you have to avoid the rusher, "I was just running my route" is NOT acceptable for impeding the rusher, you should be flagged. Don't whine to the refs, don't be a baby but also don't try to be Ray Lewis either. This is a FUN recreational event. Exercise, make friends, build relationships, have fun, play flag football. HAVE FUN HAVE FUN HAVE FUN!